Lots of kids dream about drifting off to sleep in a racecar bed every night, but as you get older, privacy and relaxation are much higher priorities. It doesn’t mean you have to eventually switch to a boring four-poster, though—not when a Portugal-based company called Circu makes a bed that lets you sleep in a VW camper van every night. No classic VW vehicles harmed in the making of the Bun Van. It’s actually a fiberglass reproduction so that it can squeeze into a bedroom without the aid of a forklift, crane, or taking down a wall. 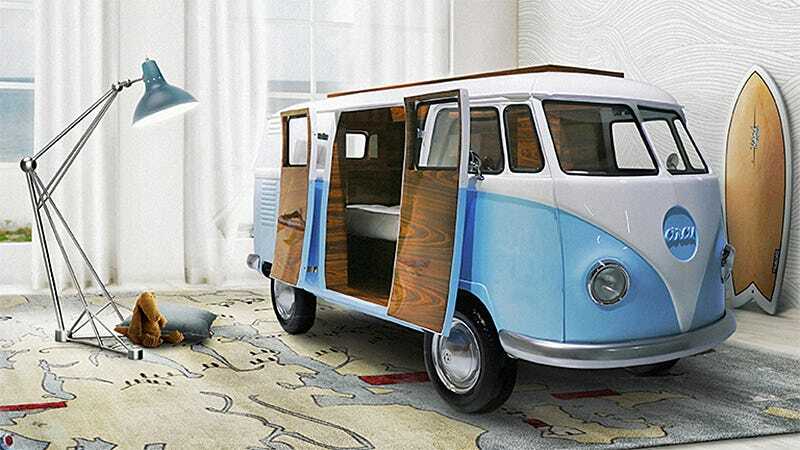 The use of chrome-plated parts and palisander wood veneers throughout give the Bun Van bed a true retro feel. And in addition to storage compartments hidden throughout, you’ll also find a flatscreen TV, a mini bar, and a sofa inside. Because the Bun Van is a limited edition creation, it’s presumably built on a made-to-order basis. And while the Circu website isn’t forthcoming on pricing info (we’ve reached out and will update once we here back). it’s safe to assume this wonderful creation won’t be as cheap as the Ikea bed you bought for first apartment.